India and South Africa have confirmed they want to introduce a special business travel card for BRICS countries which will ease visa procedures and business between members. “Areas for consideration would include the extension of multiple entry business visas for longer periods and the exploration of the proposal to introduce a BRICS Business Travel Card,”said a joint communiqué of the 9th India-South Africa Ministerial conference in Durban, South Africa, on Tuesday. South Africa is already providing business people from BRICS easier access to the country. “I have approved the issuance of port of entry visas to BRICS (Brazil, Russia, India and China) business executives for up to 10 years, with each visit not to exceed 30 days,” said the Republic of South Africa’s Home Affairs Minister Malusi Gigaba in February. The BRICS Business Travel Card’s goal is to simplify different kinds of visas as it proposes five-year validity with multiple entries to all BRICS countries. The idea of the card was introduced in 2013 at the end of the 5th BRICS Summit in Durban. India and South Africa acknowledged the significance of the role played by BRICS in achieving “more representative and equitable global governance,” and agreed to continue to work together to augment trade, investment and financial cooperation between BRICS nations. The two agreed to strengthen the BRICS mechanism, aiming to improve global political and economic governance and to make voices of emerging markets and developing countries heard in international affairs. During the most recent 6th BRICS summit in July 2014, Brazil, Russia, India, China and South Africa established the $100 billion New Development Bank (NDB). The NDB is expected to rival Western dominance in financing development and become a key lending institution. The 7th BRICS summit will be held in the Russian city of Ufa in Bashkortostan this year. 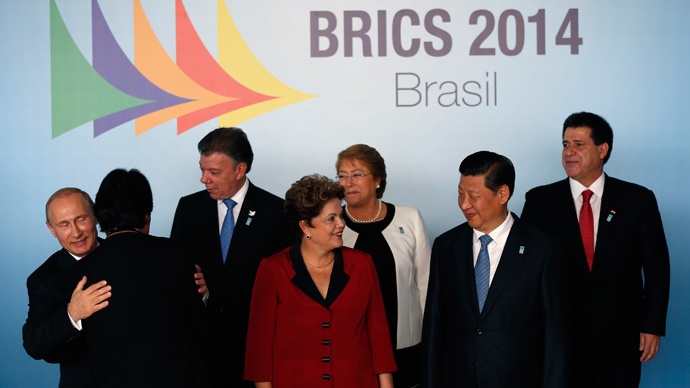 BRICS nations account for nearly $16 trillion in GDP and 40 percent of the world's population.